Something felt different as I came up the stairs from the 155th Street subway station in Harlem that Monday in 2001. Beneath the midafternoon July sun, the line outside Holcombe Rucker Park stretched down the block behind blue police sawhorse barriers. The crowd was mostly teens and grown men, dipped in standard summer street attire: icy white T-shirts, do-rags, cornrows, baggy jeans and shorts, fitted baseball caps. Security guards in bright orange Rocawear shirts patted down everyone seeking a seat. No weapons, no cameras. Those were the house rules at the world’s most famous streetball tournament, the Entertainers Basketball Classic (EBC). It was the EBC’s 20th anniversary season, and I had been spending four nights a week roaming the sidelines for a magazine partnership with Greg Marius, the EBC’s founder/commissioner. I knew that Marius, who died of cancer last week at age 59, loved putting on a show for his native Harlem — and that the former rapper yearned to have an impact beyond his neighborhood. The smile on Marius’ wide, brown face when he advised me to get to the park early meant this day would be truly special. I noticed that the first two teams warming up were not part of the regular rotation. There were no city legends such as Rafer “Skip To My Lou” Alston, Adrian “Whole Lotta Game” Walton, Larry “Bone Collector” Williams, Kareem “Best Kept Secret” Reid, or Malloy “Future” Neysmith. Also absent were NBA stars from that summer such as Ron Artest, Mark Jackson, Cuttino Mobley, Al Harrington and Stephen Jackson. The teams on the court were young, with more white players than usual. They looked out of place. This was Uptown, where local celebrities Al Cisco and Keith Slob did the Harlem Shake. Where famed announcers Hannibal, Boobie Smooth, and the duo of Duke Tango and Al Cash rocked the mic. The crowd came out to see their local heroes. Who were these schoolboys? Suddenly, a convoy of black vehicles pulled into a restricted area near the handball courts, bringing the game to a sudden halt. Murmurs ran through the metal bleachers. Police and the Secret Service spread through the park. In walked former President Bill Clinton, who had recently opened an office on 125th Street. A collective gasp echoed through the crowd. Clinton, just a few months out of office, made his way into the VIP section flanked by then-NBA commissioner David Stern and deputy commissioner Adam Silver. NBA All-Star Stephon Marbury, a Brooklynite and EBC legend, joined the trio. Marius stood next to the scorer’s table, wearing his Cheshire cat smile as if it were just another day at the park. Like Biggie Smalls said, you never thought that hip-hop would take it this far. All because of Marius’ signature blend of hoops, hip-hop and Harlem hustle. The son of a community activist mother and hospital chemist father, Marius was raised in a brownstone in the revered Strivers’ Row neighborhood. His first act was as Greg G, a rapper in the early ’80s group the Disco Four. Recording in the early days of rap on wax, the Disco Four were true ghetto superstars. Marius co-wrote singles such as “Move to the Groove” and “Do It, Do It” on Enjoy Records and “We’re at the Party” on Profile. His writing credits continued as a part of Rooftop Records, which was the early home of artists such as Kool Moe Dee and a young Harlem prodigy named Teddy Riley. Entertainer’s Basketball Classic CEO Greg Marius attends the Launch of the new Reebok Question Mid EBC & A5 with Cam’ron and Jadakiss at Rucker Park on August 4, 2016 in New York City. Marius also was a hooper. About 6-foot-5 and solidly built, Marius said he was on the team at St. John’s University during his time as a student there. The EBC was born when the Disco Four, live on the airwaves of WHBI during the legendary Mr. Magic’s radio show, challenged the rival Crash Crew to a game. The EBC followed a trail blazed by Holcombe Rucker, a city parks worker who invented the concept of summer youth basketball leagues in 1946. Holcombe Rucker’s men’s tournament drew world-class talent to various NYC parks from the ’50s through the ’70s, then fell into decline. In 1987, Marius moved his EBC to a court that the city had recently named Rucker Park, in the shadow of the Polo Grounds housing projects at 155th Street and Eighth Avenue. Those early years were lean for Marius and his partner, a street dude known only as Gusto, who used to run Harlem’s legendary Rooftop nightclub. EBC went nearly 10 years with no sponsors, surviving on loans and skimpy entry fees. Long before YouTube highlights, Marius and Gusto sold VHS tapes from their Entertainers Store on 153rd Street. Then the rap industry blew up in the 1990s, and EBC began landing five-figure team sponsorships from record labels such as Cold Chillin’, Def Jam and Uptown. Having your name on a Rucker squad bestowed clout in a rap industry that was often synonymous with the streets. And no one can gloss over the fact that EBC exploded along with the crack game. For all of the mainstream polish that would come in later years, the tournament has always been a place for drug dealers and stickup kids — and their rap game cousins — to floss. Yet Marius and Gusto kept it safe, as one of the tournament’s missions was to provide a haven for local youths during the hot summer months. As the ’90s progressed, rappers went from doing shows at clubs to selling out stadium tours. Yesterday’s street dude was remixed as a hip-hop entrepreneur. Everybody seemed to have a record label and/or clothing line. 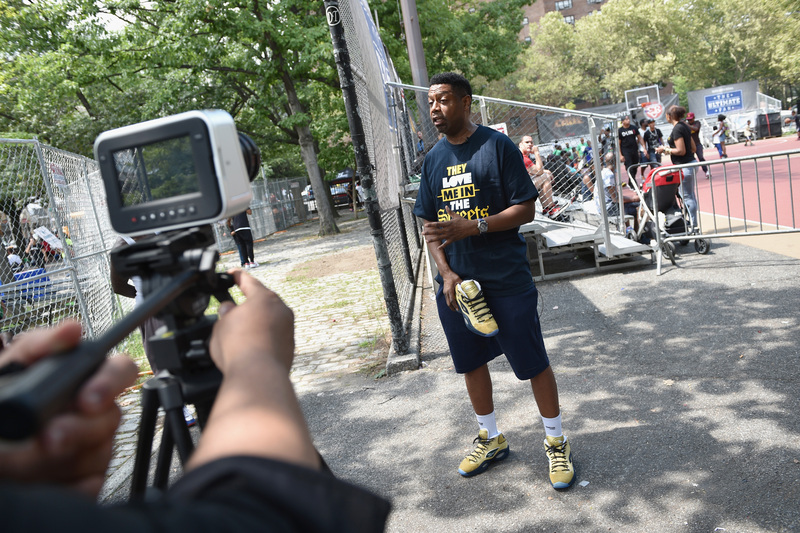 Marius, meanwhile, had EBC at Rucker Park. Making it magical every summer was his full-time job. Each year, the tournament kept getting better and names kept getting bigger. Vince Carter. Allen Iverson. Kobe Bryant. His EBC helped record companies break new artists and records. Corporations realized that his tournament was the key to breaking into the coveted urban marketplace. That street/corporate balance was the power of the EBC. I met Marius as he was cracking the mainstream in a major way. In the winter of 2000, my partner Jesse Washington, now a senior writer for The Undefeated, and I sat down with Marius at Londel’s restaurant and pitched him a magazine that would document all things related to his tournament. This is before the internet explosion, back when two-way pagers were cutting-edge tech. Think about it, we told him: EBC the Magazine. Marius silently looked at a picture of himself on the inside cover of the prototype we had made. I could see him calculating the angles. Marius knew the streets had never seen anything like this. He enjoyed making his next move even better than the last one. This could be a power move for both his brand and himself. Still, Marius was often leery of outsiders, myself included, who approached him with bright ideas on how to partner up and turn a profit. If he didn’t know you, or couldn’t associate you with someone he knew from around the way, then you weren’t in his scope. Marius had to be a wily individual to survive the sharks in the streets all those years. Harlem was his world, yet he yearned for what he had built to be recognized on a bigger stage. Other city tournaments were on the come up, poaching his players and crowds, wooing his sponsors. But none of those other tournaments had a magazine. Interacting with Marius over the summer of 2001, I came to view him as a hard character to truly peg. At his core he was a good dude, raised by good parents in a good neighborhood. This background stood in stark contrast to the shadowy characters and cutthroat street environments that surrounded his adult life. Doing business with Marius was tricky. Because he was getting checks from so many different places, I never knew when his other hustles would bump up against our magazine. “Hype it up, but keep it separate” is one of his most memorable quotes to me. The Rucker Park court stayed hot that summer. After Clinton stopped by, Shaquille O’Neal made a cameo after winning the NBA title. Street legends and NBA stars mixed it up game after game. I even found my way onto a team in the women’s division thanks to rapper and EBC team owner Fat Joe. My game wasn’t at its peak, but I managed to knock down a couple of jumpers, grab some steals and rebounds, and even earned the nickname “The Editor,” aka “The Magazine,” from announcer Al Cash. With Marius at the helm, the EBC not only stayed relevant for 30 years but also revived the Rucker name and spread it across the globe. Marius was able to navigate among the illest of street dudes and still receive Secret Service clearance to host a president in Harlem. Greg’s Harlem. The basketball world will always know the Rucker. Harlem will never forget Greg Marius.